At VIP PowerLounge you play slots in the basic game with 10 credits each spin. 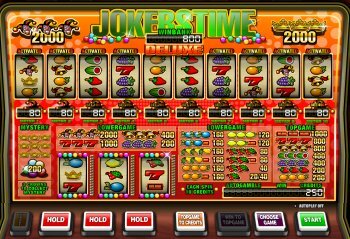 The spectacular top game of the Jokers Time de Luxe has 10 reels! Decide your bet up to 450 credits each spin. Watch the Jokers and the Crowns. These symbols will give in the top game 2000 credits. In the basic game the crowns counting for 200 credits. A unique experience. Play also one of the other great slots by VIP Power Lounge.